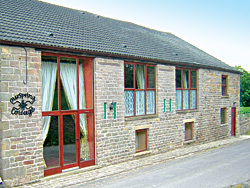 Horwich Farm Holiday Cottages are located near Whaley Bridge in the High Peak region of North Derbyshire, which is renowned as being one of the most outstanding areas of natural beauty in the British Isles. Apart from the breathtaking scenery the area is full of fascinating places to visit, outdoor activities, famous walks, quiet villages, bustling market towns, historical sites and a thousand and one things to do. On the other hand, if you wish to relax in peaceful surroundings - the High Peak has plenty of those too! The farm is ideally situated for those wishing take advantage of the local surroundings for: Walking; Cycling; Mountain biking; Sightseeing; Paragliding; Sailing; Motorcycling; Climbing and much more. Click on Attractions for more information. Horwich Farm is located a short walk from the village of Whaley Bridge, on the edge of the Peak District National Park and the Goyt Valley. In the village there are a variety of pubs (some having live entertainment at weekends), restaurants, takeaways, convenience stores, hairdressers and a supermarket, all within easy reach. Click on Amenities for more information.